Ho Chi Minh City (also still called Saigon) is famous for its pho (traditional Vietnamese noodle soup) and pork rolls. Often the best places are shops and stalls named after family members, such as "Aunty" or "Chi" (meaning sister) followed by a number representing their order in the family and, finally, their name. Though many chains, such as Pho24 and Pho 2000, do big business these days, you can't beat family-run outfits for the real deal. Manicure and pedicure shops are everywhere, particularly around the Pham Ngu Lao area, and most are open late into the night. Happily, some will even serve you a glass of wine or offer a massage, and a basic treatment will probably cost you less than half what it would back home (expect to pay about $6 for a set). Those looking to take the pampering up a notch might try My Spa or Spa Authentic. myspa.com.vn. Exploring the streets from the back seat of a Vespa is an exhilarating way to get a feel for a city with nearly 5 million motorbikes. To get your orientation fast, jump on an organised tour with an emphasis on food, nightlife, iconic sights or unusual attractions; a guide can help you discover the hot spots. 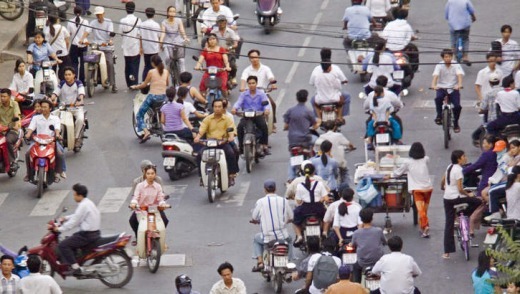 Note that motorbike helmets are compulsory in Vietnam. For shorter day tours, try xotours.vn, or vietnamvespaadventures.com for longer excursions. Though it's true the Saigon River has serious pollution issues, a Bonsai dinner cruise is still a unique experience. Watch the city lights at sunset while sipping a Tom Collins from the deck of a traditional 19th-century dragon boat, take in a show and enjoy a buffet meal in style. Try to pre-book and stretch your dollar for a more boutique cruise if funds permit. bonsaicruise.com.vn. Found on most street corners and in ramshackle bars, fresh beer, or "bia hoi", is Vietnam's answer to microbrewing. First introduced by the Czechs, it's free of preservatives and therefore best gulped down immediately. The standard is seriously variable, but it certainly won't hurt your wallet (expect to pay about 35¢ to 40¢ a glass), so trial and error is part of the fun. Look out for the ubiquitous hand-scrawled Bia Hoi signs. Designed and built by French architect Gustave Eiffel (yes, he designed another fairly famous building or two), the Gothic-styled Saigon Central Post Office began its life in 1886 and remains one of the country's most celebrated structures. Inside, beneath a long, domed roof, walls decorated with French colonial maps flank a portrait of Ho Chi Minh, while the elaborate tiled floors complete the refined look. Opposite, the neo-Romanesque Notre-Dame cathedral, built between 1863 and 1880 by French colonists, is equally impressive. Fertilised duck eggs, fermented scorpion wine, deep-fried snake dishes: Vietnam is synonymous with cuisine to put hairs on your chest. Try to avoid restaurants prone to killing the snake in front of you (some diners like to feast on the still-beating heart). It's not kind to the snake and it won't increase virility. Reputable hotels can point you in the direction of a good restaurant with such creatures on the menu, or look out for glass bottles of snake wine known as "ruou thuoc" at most markets. Don't worry, the venom is neutralised by the ethanol. There isn't much you can't buy from a market here, and although haggling is an art form requiring practice, it's still easy enough to pick up a bargain. 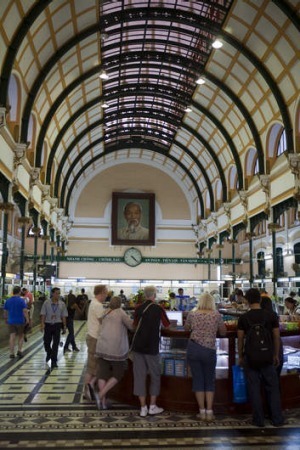 District 1's Ben Thanh Market is certainly the most famous — there are more than 3000 stalls — but prices can often be inflated for tourists. For a lesser-known alternative, District 1's Tan Dinh specialises in silks and clothing material, while Ben Thanh night market is popular for those who prefer bargain hunting free from the noon heat. Equivalent to Bangkok's famed Khao San Road, Pham Ngu Lao Street is HCMC's backpacker district, and it's where the revelry goes on long into the night. If you're looking for a more urbane option, try a rooftop bar hop of three of the city's most famous hotels, the Rex, Caravelle and Majestic. Yes, drinks are nosebleed expensive, but there's a colourful history and impressive view from each. For a refined colonial feel, Temple Club serves up a mean gin and tonic in a former temple guesthouse, while the Dong Khoi area is home to several live-music venues and more upmarket bars. anyarena.com. Since its introduction to Vietnam by French colonists in the 19th century, coffee has become a national obsession that rivals our own. Thanks to the intense humidity, iced coffee, known locally as "ca phe sua da", is generally favoured, and is brewed with a dark roast over a single metal french drip filter called "ca phe phin". Served with sweet condensed milk poured over ice, it's the perfect kick-start. Head to the Tan Tao Park to enjoy an early-morning brew with the locals or order a cup from any street vendor. After sampling so much great food, chances are you'll want to replicate it. While many of the major hotels offer generic cooking lessons, a smaller-size class is a far better option. The best classes will team you with a chef to source ingredients at a nearby market before you learn to cook classic dishes such as summer rice rolls, rice noodle soups and many more. Most provide a take-home recipe pack so you can dazzle your mates back home. See saigoncookingclass.com for private, full-day and half-day classes. Often dubbed the "rice bowl" of Vietnam, this 39,000-square-kilometre labyrinth of waterways remains one of the most densely populated parts of the country. About four hours' drive from the city, it's another world, where markets, villages and schools float on sprawling, life-sustaining estuaries. It's easiest to experience the delta on a tour, with most ranging from between one and five days. Spend a few days here if time permits; you can even make your way over to Cambodia by river, rather than by plane or bus. sinhbalo.com, mekongdeltatravel.com. You don't know the true meaning of claustrophobia until you've visited this vast network of interconnecting underground tunnels, 30 kilometres from Ho Chi Minh City. Used as operational headquarters by Vietcong guerillas during the Tet Offensive of 1968, they were instrumental in numerous military campaigns during the war and played a decisive role in defeating American forces. A guided tour allows you to explore the tunnels firsthand or even fire an AK-47 should you wish to emulate Chuck Norris for a day. cuchitunnel.org.vn. While the World Heritage-listed riverside town of Hoi An, about 865 kilometres north of HCMC, remains Vietnam's top spot for quality tailoring, HCMC is another safe bet. For best results, go prepared, take magazine cutouts and bring clothing you want to replicate. Have a set budget in mind, too; it's easy to get talked into an entire new wardrobe. Allow a few days for the necessary adjustments. For high-end tailoring, try Mi Silk, 181 Dong Khoi, District 1. Markets aside, there are plenty of options for high-end shopping. The major department stores are found at the central business district's Diamond Plaza or Saigon Centre — though prices won't differ much from home — while locals tend to favour Trai Street, straddling districts 1 and 5 for cheaper goods. Le Cong Kieu is famous for antiques, and the relatively new Vincom Centre opposite the Hotel Continental is a good bet for pricier, high-quality and boutique wares, while fashionistas will love Nguyen Hue Street.